We love making Chinese Christian products like this one. Our key vision in this store is to make meaningful Christian art which can stimulate amazing and important conversations. The very first item we ever created and sold was our Bible verse in Chinese calligraphy wall scrolls. These are not only beautiful, but are deeply meaningful and make excellent Chinese gifts for almost any occasion. 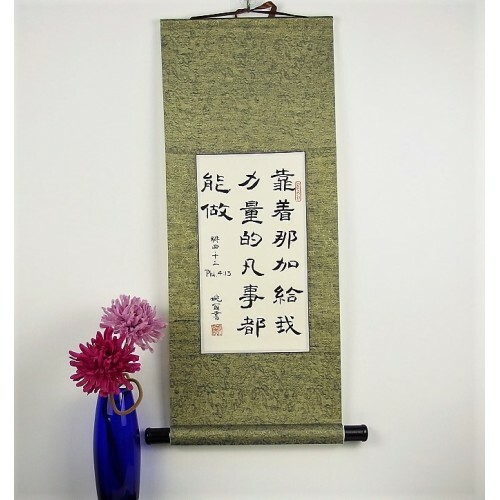 You can choose any Scripture for a custom made Bible verse scroll. We will take the Chinese characters directly from the text of the official Chinese Union Version. If you choose two verses then we suggest choosing a larger size. You can also choose color and background painting style along with a custom inscription. 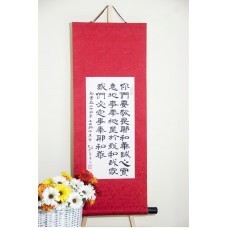 Our Chinese Bible verse wall scrolls are currently hanging in many homes around the world. Christians looking for some Chinese home decor love these. The best part is you can choose a verse that is meaningful for you. Give them as a wedding present, a baptism gift, a housewarming gift, donor gift, graduation, etc. 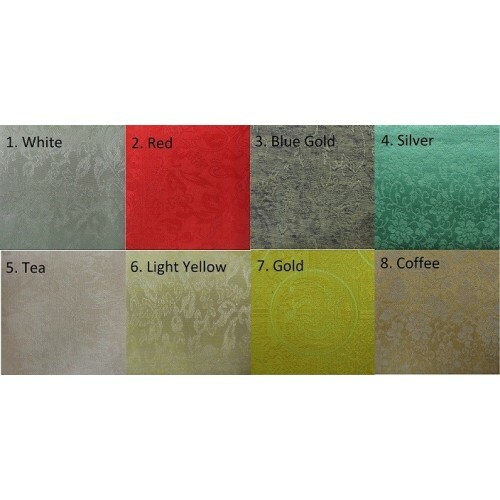 Size: 11" X 32" (25 Cm X 80 Cm) - Size may be adjusted according to the length of the verse you choose. Click links for flower background example, bamboo background, and bamboo and butterfly background for options to spice up your scroll. Sales of our products help us dedicate more time to serving the people and taking the good news into this harvest field. Thank you for your support!